This morning we were rushing to go to the school to meet the bus. 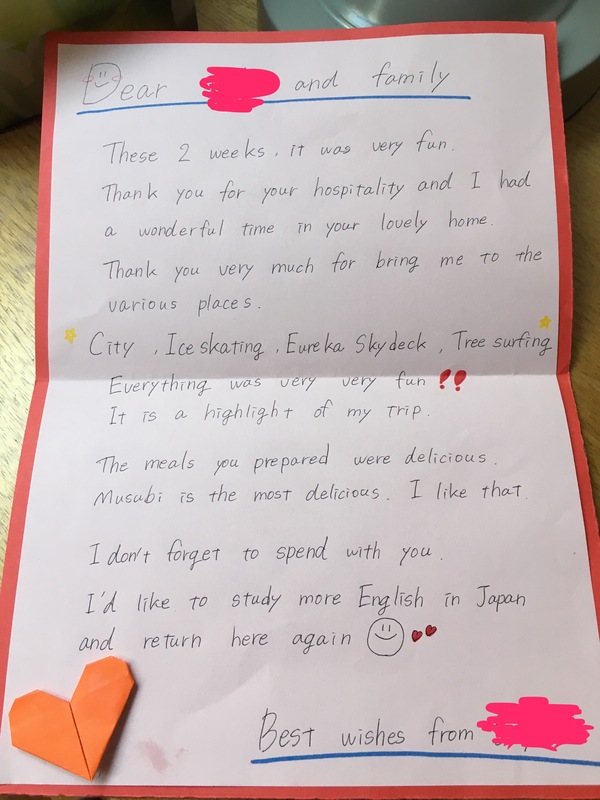 I asked our Japanese student what she would like for breakfast? I offered toast as an option. She thought about it and said Musubi? I was like what? Anyhow I relented thinking she must be missing rice as the last two nights we had burger then souvlaki. Plus it’s her last meal with us and well I did have some left over rice from the other day and enough ingredients to make it. Kikkoman soy, sugar, rice vinegar, Spam, seaweed. Since she was just standing there I showed her how to make it so she can make it when she goes back to Japan. I also gave her a can of Spam to bring back. It was before we got into the car that she gave my daughter this card.